Despite recently celebrating a decade of decentralized technology with Bitcoin’s 10th anniversary, the blockchain space still faces several challenges which many blockchain projects have failed to overcome. While decentralized technology holds untold promise across multiple industries, there are persistent problems with slow transaction speeds, smart contract creation, security and the management and updating of blockchains. Specifically, the knowledge required to code and execute smart contracts creates a high barrier to entry for non-technical users and limits their potential usefulness for businesses and individuals. Likewise, when smart contracts are coded, they’re often vulnerable to exploits and security flaws. However, there’s one project which is leveraging the latest developments in artificial intelligence (AI) and machine learning to create a blockchain capable of overcoming these limitations – the Matrix AI Network. 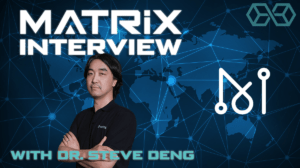 Blokt had the opportunity for an exclusive technical interview with the esteemed Professor Steve Deng, Chief AI Scientist and founder at Matrix AI Network, to discover more about his revolutionary blockchain which operates at the nexus between the emergent AI and blockchain industries. 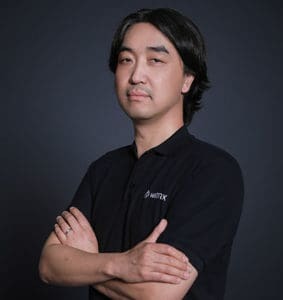 Blokt caught up with Professor Steve Deng, the Chief Scientist Behind Matrix AI Network, and esteemed AI researcher. Your technology is making waves within the blockchain and AI industries, can you give us a brief introduction to the Matrix AI Network? There are currently two big problems slowing the development of AI. First, there is a chronic lack of computing power for AI in research and social good. Second, many areas of AI lack the scale of data to see a qualitative improvement in AI models. To address this, the Matrix AI Network platform connects people and business applications around the world, whilst at the same time powering AI for social good. Today only a small fraction of AI’s potential uses are widely implemented, so Matrix is building a complete blockchain infrastructure capable of supporting the exponential growth of AI tasks being processed in parallel. An important goal of this infrastructure is increased data portability, enabling data to safely flow and be managed effectively across public and permissioned systems. This will drive progress in AI, by allowing more datasets to achieve transformative scale. To make the ongoing adoption of AI easy, we’ve built an intuitive, user-friendly frontend portal for our on-chain AI services. The Matrix team has an impressive academic track record, with three of your five core team members holding PhDs- how will an academic approach set you apart from other blockchain projects? Our leadership team certainly has strong academic roots, and Matrix is built upon many years of their research results. The Matrix team were able to reimagine the role of blockchain within the next-generation technology ecosystem. Compared to most other blockchain companies, the Matrix team have asked fundamentally different questions. Academia has strong ties with the open source community, with a shared commitment to documentation, transparency, and peer review. Today, the world’s most sophisticated computing systems are often custom variants of open source tools. We’ve also seen sky-high acquisitions and investments within open source companies such as Red Hat, Docker and Data Artisans, the developers behind Apache Flink. From a business perspective, our academic specialization in machine deep learning and Bayesian methods, alongside the complexity of our integrated software/hardware approach, is an easily defensible competitive advantage. This advantage is also why much of our leading AI talent is homegrown from my students at Tsinghua University, who are now making their own groundbreaking contributions. My team and I also continue to publish AI research, submitting papers to academic conferences, and participating in nationally funded research projects. What most inspired you to build AI and blockchain solutions? My inspiration was to power more forms of AI research and AI for social good by developing green mining for blockchain. With the revolution of public blockchains connecting millions of devices globally, we were not only forming intelligent distributed networks for processing information more transparently — there was also a massive untapped value to repurpose the vast processing power of the network for AI applications. Highly efficient systems utilize virtually all available energy and resources, so we wanted to expand the blockchain design not only to serve as an improved end-to-end data management platform, but also directly power AI processing of that data. Since the Matrix ICO ended, you’ve allocated 20% of ICO funds to research and development of a Bayesian ASIC miner. What advantages will this mining hardware offer over traditional mining rigs? I established and ran the Bayesian Computing Laboratory at Tsinghua University with the goal of exploring new approaches to computing, which “think and learn like human beings.” We are primarily exploring this concept through a combination of Bayesian and Deep Learning methods. Our earliest thinking for a green-mining AI application over blockchain was to use Markov Chain Monte Carlo (MCMC) methods, which is a powerful and influential form of Bayesian reasoning. However, it’s not a very practical choice for today’s blockchains yet because of the huge strain on the online network to verify the results. We will switch back to this option when the network bandwidth is sufficient in the future. Our current green-mining machine is an AI accelerator, optimized for a common group of deep learning models which integrates with the consensus mechanism of the blockchain. The flexibility of a field-programmable gate array (FPGA) approach allows us to progressively introduce more AI models powered by blockchain in the future. Another huge area for future innovation is developing a way to also train models over blockchain, which is a compute-intensive need. Matrix AI Network is building a hybrid Proof of Stake (PoS) & Proof of Work (PoW) consensus mechanism. How does this differ from other PoS blockchains, and what part will dedicated mining hardware play in reaching consensus? A key advantage of our hybrid PoS and PoW consensus algorithm allows us to support 5,000 transactions per second on chain and fully encrypted. The stochastic clustering algorithm also makes collusion among bad actors nearly impossible, by randomly selecting participating nodes across the network. Additionally, our election cycles are set for a finite period, limiting the amount of time that any group of nodes is working together. Likewise, we also have a validator network and randomized validator nodes overseeing each round for enhanced safety. We believe this consensus mechanism has the best balance of performance and safety, with some AI enhancements. We certainly welcome other blockchains which have adopted or plan to adopt something similar. For us, our hybrid consensus mechanism is an essential foundation for highly effective operations, but we have plenty of other value-added innovations. Our green mining machine, which is an AI accelerator for deep learning models, effectively integrates with and processes the consensus algorithm, but the main innovation is processing AI through the blockchain network. One of Matrix’s most promising and awaited features are self-coding smart contracts. Can you talk us through what some use cases for these auto smart contracts might be, and how do they work? Smart contracts are one of the most revolutionary features of blockchains, but they have also been one of the greatest barriers to adoption, and are also a source of many costly security vulnerabilities. While multiple sophisticated methods are running in the background, it was important for us that the interface for auto-coding intelligent contracts was extremely intuitive. Based on natural language inputs in both English and Chinese, our self-coding smart contracts identify templates that clearly structure the intended transactions based on the safe approved smart contract library. Matrix accomplishes this by using our semantic and syntactic analysis engine, formal verification to identify loopholes and vulnerabilities in hardware and software, AI-based transaction model identification, and a deep learning platform for system-wide evolution. A look at how self-coding smart contracts will function on the Matrix AI Network blockchain. What has AI integration with blockchain allowed the Matrix AI Network to achieve, which blockchain technology alone wouldn’t have been sufficient for? As we look forward to an approaching generation of highly interoperable multi-party data platforms, as a result, there will be a high concurrency of interactions. In this instance, blockchain will be a crucial improvement in maintaining the completeness, accuracy and sequential integrity of data. Having high-quality data is critical to the accuracy of predictive modeling for AI, so on-chain processing of AI tasks offers a more seamless coupling of key links in the data supply chain. Similarly, we designed the Matrix blockchain protocol from the ground up with AI optimization built into every operation. In addition to our self-coding smart contracts, our multi-chain architecture uses generative adversarial networks (GANs) to dynamically select and evolve parameters based on the localized observed behavior on the chain. This subsequently optimizes configurations, so that activity on subchains can advance, whilst prevent forking on the control chain. An important cybersecurity consideration for enterprise-grade interoperability is being able to safely connect a range of legacy systems and online/offline sources. This is why Matrix uses AI verification in our secure gateways as a best practice to share data responsibly. Matrix is an open source project, does this mean that in the future you will be open to third-party developers building solutions and dApps on top of the Matrix AI Network? Yes, absolutely. Even as we were still completing the mainnet, our team was working with industry partners to develop subchains with custom features built into our core AI and blockchain capabilities. Matrix AI Network also has its own in-house gaming team, who have just released their first blockchain based game. Now with the official release of the mainnet, we’re ramping up our partnership with developer communities around the world, and expanding developer tools. It’s the perfect time for developers to start building on the Matrix AI Network. Does Matrix have any partnerships in the pipeline, or recently signed, that you are at liberty to discuss? Personally, I’m most involved with solutions that Matrix is currently building out for high-speed rail and AI-assisted medical diagnosis. The rail project is building on 30 patents that I’ve applied for, or in the process of applying for, in AI supported diagnostics and fault prediction. This project also further leverages AI, blockchain, cloud, and IoT tools over our Matrix platform, then integrates with ERP systems for things like visualization and reporting. For AI in medicine, Matrix is working closely with two of the top hospitals in China – the Shanghai Pulmonary Hospital at Tongji University, and Huadong Hospital at Fudan University. Top medical experts have already provided high quality labeled data for over 2,000 patients from early screening, for CT imaging to biopsy data. The Matrix platform is now helping to expand the number of participating institutions and experts, for richer data to develop more accurate AI models, a particularly rewarding avenue of research. As the blockchain industry matures, other AI-based blockchain companies are emerging with strong academic ties, such as the Endor predictive analytics protocol. What advantages do you have over these projects, or conversely, do you see room for collaboration in the future? There is exciting and valuable innovation happening across many areas such as blockchain, AI, WebAssembly, and industrial IoT and other dynamics fields. We welcome breakthroughs happening everywhere, and we see Matrix AI Network as a way to enable greater innovation in the future. Strengthening interoperability and data portability is key to our growth roadmap, and it serves the growth of blockchain and AI worldwide. Finally, Matrix has been established since 2016, which for a blockchain company means you have great experience to share. What are your predictions for the future adoption of blockchain technology and AI solutions? Permissioned blockchains have already achieved substantial enterprise adoption with industry shaping changes in supply chain, finance, insurance, international settlements, and more. Aside from Matrix AI Network’s unique AI capabilities, one of our goals is to build a complete hybrid public/private distributed computing ecosystem with high enough security and performance to integrate with enterprise systems. Likewise, we see data privacy currently undergoing a major transformation within governments, and individuals calling for more transparent and secure data management solutions. In order for data to achieve an impactful scale capable of training more powerful AI models, it’s critical that we enable data to flow securely between public and closed systems, which forms part of our impetus for partnering with leading hospitals in China to improve in these areas. Blokt would like to thank Professor Steve Deng and the Matrix AI Network team for sharing their expertise. Matrix AI Network Are Building the Most Advanced Blockchain to Support AI Growth [Exclusive] was originally found on copy trading cryptocurrency | Blockchain News | Bitcoin News | blokt.com.